The human corneal surface epithelium is continuously repopulated by the limbal stem cells (LSCs). Limbal Stem Cell Deficiency (LSCD) can lead to corneal opacity and vascularization, with consequent visual impairment or blindness. Many acquired and congenital diseases can lead to LCSD by direct injury to the LSCs, destruction of LSC niche, or both. Based on the severity of the disease, LSCD can present with various symptoms and signs. Although LSCD can be detected clinically, laboratory tests are necessary to confirm the diagnosis and monitor the disease progression. This article concisely reviews the clinical presentation, techniques for diagnosis and management of LSCD. The ocular surface of the eye comprises of the cornea, conjunctiva and limbus and is protected by stratified, non-keratinizing squamous epithelium. The corneal epithelial cells undergo constant renewal and regeneration. The stem cells responsible for this corneal epithelial renewal are presumed to reside within the basal epithelium at the limbus. ,,, Cells from the corneal surface are desquamated and replaced by proliferating basal epithelial cells migrated from the periphery. Thoft and Friend proposed a 'X, Y, Z hypothesis' of corneal epithelial maintenance in which the desquamated cells (Z component) are continuously replaced not only by the basal cells (X) but also by cells that migrate in from the periphery (Y). Thus, migration occurs centripetally and circumferentially from the limbus and vertically from the basal layer forwards. Limbal stem cells (LSCs) maintain the integrity of the corneal surface, and the limbus might also function as a physical barrier that prevents conjunctival epithelium from growing onto the cornea. In limbal stem cell deficiency, (LSCD) the corneal epithelium cannot be renewed and is replaced by the conjunctival epithelial cells. LSCD can also be categorized as congenital or acquired [Table 1]. Diseases in the congenital category include; aniridia, , keratitis associated with multiple endocrine deficiency, , dyskeratosis congenita, , and epidermal dysplasia. , Common causes in acquired LSCD include chemical and thermal burns, multiple ocular surgeries involving the limbal region, contact lens wear, and ocular surface inflammatory diseases. ,,,,, In contact lens wear, chronic mechanical microtrauma, hypoxia, and irritation from contact lens solution might be responsible for the damage to the limbus. 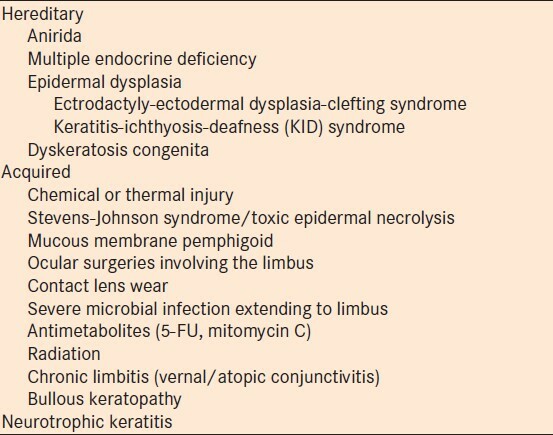 Inflammatory diseases involving the ocular surface such as Stevens-Johnson syndrome More Details and mucous membrane pemphigoid are well known acquired etiologies that can lead to LSCD. Other inflammatory conditions such as severe chronic vernal keratoconjunctivitis and microbial infection involving the limbus can directly destroy the stem cells. Radiotherapy and toxicity from topical medications such as mitomycin C and 5-FU can directly destroy the stem cells and their niche. , Long-term topical medications and aphakic and pseudophakic bullous keratopathy can also cause LSCD. Idiopathic LSCD is also a known clinical entity when no known cause can be found. Clinical manifestations of the LSCD varies based on the severity and extent of involvement. In partial or sectoral LSCD, in which only a segment of the limbus is involved, stippled late fluorescein staining is seen due to the loss of cell-cell tight junction that leads to staining of the basement membrane [Figure 1]a. These abnormal cells may be a mixture of metaplastic corneal epithelial cells and conjunctival epithelial cells. The stippling fluorescein staining could follow a vortex pattern [Figure 1]b. There might be thinning of the epithelium layer. A clear line of demarcation may be visible between the corneal and conjunctival epithelial cells. The fluorescein dye tends to pool on the conjunctivalized area, because of the relative thinner epithelium. Patients at this stage may experience decreased vision and photophobia. Additional features may include unstable tear film, filaments or erosion over the affected area. Disarrayed limbal palisade of Vogt and perilimbal vascular arcades are early anatomical changes in mild cases of LSCD. However, absence of palisades of Vogt alone does not indicate LSCD. , In moderate to severe cases, as the limbal function declines more, clinical features include recurrent epithelial defects and superficial vascularization. The vision is further compromised. Persistent epithelial defect (PED) may lead to scarring, ulceration, stromal neovascularization, corneal thinning or even perforation. Recurrent corneal erosion or PED causes severe pain, photophobia and greatly decreased vision [Figure 2]. If there is also the presence of tear deficiency, keratinization may occur. Total LSCD is characterized by a complete absence of limbal stem cell populations accompanied by conjunctivalization of the entire corneal surface [Figure 1]c.Neovascularization is often seen but might not be present in some cases of LSCD. The patient is functionally blind [Figure 2]. The conjunctiva is also involved in many diseases that cause LSCD, such as chemical burns, Stevens-Johnson syndrome, mucous membrane pemphigoid. Chronic inflammation often causes fibrosis and continues to cause damage to the conjunctival and LSCs. Subconjunctival fibrosis leads to symblepharon formation and forniceal foreshortening. Goblet cell deficiency is often seen in these diseases. This also contributes to the poor tear function and further worsens the ocular surface in these patients. LSCD can be detected clinically based on the presentation described above. However, some of the signs present in LSCD are also seen in other conditions that do not have a component of LSCD. In particular, signs in partial LSCD are often subtle and non-specific. Laboratory tests are necessary to confirm the diagnosis of LSCD and monitor success of surgical interventions. In this section, impression cytology and in vivo confocal microscopy are discussed. Impression cytology has been the gold standard diagnostic test for LSCD. A nitrocellulose acetate filter paper is often used. It is placed on the ocular surface and usually removes 1-3 cell layers. It is therefore, ideal to study superficial cells. The cells collected on the membrane can be then subjected to histological, immunohistological, or molecular analysis. Conventional histological staining such as haematoxylin or Periodic acid Schiff or Papanicolaou is performed on the membrane. The epithelial morphology and goblet cells are evaluated. The presence of goblet cells on the cornea signifies conjunctival epithelial invasion. However, in conditions, including chemical or thermal injuries, goblet cell deficiency is also present in up to 36% of patients. Hence the lack of goblet cells may lead to false-negative results. The epithelial morphology alone cannot distinguish conjunctial epithelial cells from corneal epithelial cells. Cytokeratins are a group of proteins that form intermediate filaments in epithelial cells and are expressed in distinct patterns during epithelial development and differentiation. Immunocytochemistry on impression cytology specimens could identify the specific cytokeratin and hence the type of epithelium. There are several conflicting reports in the literature regarding the specificity of the cytokeratin expression. Cytokeratin 3/12 are regarded as markers of corneal epithelial differentiation while Cytokeratin 19 has been reported as conjunctiva specific cytokeratin. , However, recently Cytokeratin 7 and 13, mucin (MUC) 1 and MUC5AC are reported as being more specific for conjunctival epithelium than cytokeratin 19. ,,, It has also been reported that molecular analysis using RT-PCR for the detection of MUC5AC transcript in the corneal epithelium is a sensitive, specific and objective technique. The specificity of these new markers needs to be confirmed by subsequent studies. Refinement of the molecular analysis techniques would be necessary to establish this method as a more sensitive and specific diagnostic tool to detect specific markers of the conjunctival and corneal epithelium. In vivo laser scanning confocal microscopy (IVCM) provides high-resolution images of the ocular surface at the cellular level. Its use in ophthalmology has expanded tremendously over the last decade. Recently, IVCM has been used to study corneal and limbal microstructures. ,, In normal cornea, wing cells have a dark cytoplasm, well-defined bright borders and no visible nuclei. The deep basal epithelia layer cells are smaller in size, with no visible nuclei and the cell border is still very well defined. In addition, palisades of Vogt may be detected as hyper-reflective, double-contour linear structures in confocal microscopy of the living scleral limbus. , There are significant microstructural changes in LSCD. Vera et al. reported corneal epithelial abnormalities and absence of the subbasal nerve plexus in patients with chronic Stevens-Johnson syndrome, toxic epidermal necrolysis and LSCD. Recently, microstructural changes have been detected in the cornea and limbus in LSCD compared to normal controls. In this study, patients are classified into 3 stages of LSCD: early, intermediate, late stage based on clinical presentation and evaluated the corneal and limbal epithelium changes on confocal microscopy. Significant microstructural changes in the corneal and limbal epithelium are seen even in the early stage of LSCD [Figure 2]. The corneal epithelial cells in LSCD have less distinct borders and have prominent nuclei. The size of basal epithelial cells increases. Epithelial cells in the deeper layers become affected in more advanced stage of LSCD. In the late stage, epithelial cells show significant metaplasia and there is neovascularization. Compared with the healthy control subjects, eyes with early stage LSCD have an average of 38% reduction in basal epithelial cell density and a 58% reduction in subbasal nerve density. The limbal epithelium also shows similar changes and there is an absence of palisades of Vogt. A combination of morphological changes in the corneal epithelium, and a significant reduction in both basal epithelial cell density and subbasal nerve density might be the early signs of LSCD. Detection of goblet cells in the corneal epithelium of patients with LSCD has been reported. However, there is inconsistency regarding the morphological features of goblet cells on the confocal images. Some reported that they presented with a hyperreflective cytoplasm,  others suggested hyporeflective cytoplasm. This variation might be due to the different content of the goblet cells. Nevertheless, the absence of goblet cells does not signify the absence of LSCD. Unilateral or bilateral partial LSCD may only require observation if the patient is asymptomatic. Repeated mechanical debridement known as the sequential sector conjunctival epitheliectomy, amniotic membrane transplantation, and ipsilateral limbal translocation to an area of LSCD are suggested as an early therapeutic option. ,, Amniotic membrane promotes epithelialization and reduces angiogenesis and inflammation. It preserves and maintains the epithelial progenitor cells and thus can be used instead of limbal transplantation in the management of partial LSCD. Alternatively, limbal tissue harvested from a healthy area may be cultured ex vivo and transplanted to one or both eyes in case of bilateral involvement. Total unilateral LSCD requires a conjunctival limbal autograft which may be harvested from the healthy fellow eye. Successful transplantation of conjunctival limbal autograft from the healthy fellow eye for a large series of cases with unilateral LSCD was first reported by Kenyon and Tseng in 1989. Such large grafts post a significant risk of developing iatrogenic LSCD in the donor eye. Alternatively, a small piece of limbal tissue, usually 2 × 2 mm, may be harvested from the healthy fellow eye or donor eye and transplanted following ex vivo cultivation of stem cells on various substrates and achieve excellent long term clinical outcomes. , Recently, a technique called "simple limbal epithelial transplantation" was described. Direct transplantation of the 2 × 2 mm piece of healthy limbal donor that is cut into pieces and secured on amniotic membrane using fibrin glue without ex vivo cultivation can successfully reconstruct the ocular surface after pannus excision. The long term result of this technique is unknown. In total bilateral LSCD, limbal stem cell transplantation from allogeneic tissue is necessary. Allogeneic tissues may be obtained from a cadaveric or a living-related donor and transplanted to the ocular surface directly. , Alternatively, transplantation of the cell sheet after cultivation can also achieve success. Allografts require prolonged systemic immunosuppression and the long-term survival of allograft is worse than that of autologous transplantation. Transplantation of cultivated autologous oral mucosal epithelial cells has achieved good success in stabilizing the ocular surface. , The visual improvement using this approach is not as optimal. In summary, diagnosis of LSCD is often clinical. Significant advances have been made to develop noninvasive tests to objectively diagnose LSCD in recent years. Diagnostic tests that can quantify the stem cell function may help to develop a classification system for LSCD, and monitor the progress of the disease and treatment outcomes. The management of LSCD remains challenging. Many medical and surgical options are available to rehabilitate the ocular surface. When judiciously used, successful outcomes can be achieved in a majority of cases. 1. Davanger M, Evensen A. Role of the pericorneal papillary structure in renewal of corneal epithelium. Nature 1971;229:560-1. 2. Cotsarelis G, Cheng SZ, Dong G, Sun TT, Lavker RM. Existence of slow-cycling limbal epithelial basal cells that can be preferentially stimulated to proliferate: Implications on epithelial stem cells. Cell 1989;57:201-9. 3. Lavker RM, Tseng SC, Sun TT. Corneal epithelial stem cells at the limbus: Looking at some old problems from a new angle. Exp Eye Res 2004;78:433-46. 4. Schermer A, Galvin S, Sun TT. Differentiation-related expression of a major 64K corneal keratin in vivo and in culture suggests limbal location of corneal epithelial stem cells. J Cell Biol 1986;103:49-62. 5. Thoft RA, Friend J. The X, Y, Z hypothesis of corneal epithelial maintenance. Invest Ophthalmol Vis Sci 1983;24:1442-3. 6. Nishida K, Kinoshita S, Ohashi Y, Kuwayama Y, Yamamoto S. Ocular surface abnormalities in aniridia. Am J Ophthalmol 1995;120:368-75. 7. Skeens HM, Brooks BP, Holland EJ. Congenital aniridia variant: Minimally abnormal irides with severe limbal stem cell deficiency. Ophthalmology 2011;118:1260-4. 8. Puangsricharern V, Tseng SC. Cytologic evidence of corneal diseases with limbal stem cell deficiency. Ophthalmology 1995;102:1476-85. 9. Mohammadpour M, Javadi MA. Keratitis associated with multiple endocrine deficiency. Cornea 2006;25:112-4. 10. Aslan D, Akata RF, Holme H, Vulliamy T, Dokal I. Limbal stem cell deficiency in patients with inherited stem cell disorder of dyskeratosis congenita. Int Ophthalmol 2012;32:615-22. 11. Aslan D, Akata RF. Dyskeratosis congenita and limbal stem cell deficiency. Exp Eye Res 2010;90:472-3. 12. Felipe AF, Abazari A, Hammersmith KM, Rapuano CJ, Nagra PK, Peiro BM. Corneal changes in ectrodactyly-ectodermal dysplasia-cleft lip and palate syndrome: Case series and literature review. Int Ophthalmol 2012;32:475-80. 13. Di Iorio E, Kaye SB, Ponzin D, Barbaro V, Ferrari S, Böhm E, et al. Limbal stem cell deficiency and ocular phenotype in ectrodactyly-ectodermal dysplasia-clefting syndrome caused by p63 mutations. Ophthalmology 2012;119:74-83. 14. Sangwan VS, Jain V, Vemuganti GK, Murthy SI. Vernal keratoconjunctivitis with limbal stem cell deficiency. Cornea 2011;30:491-6. 15. Bhatia RP, Srivastava R, Ghosh A. Limbal stem cell study in contact lens wearers. Ann Ophthalmol (Skokie) 2009;41:87-92. 16. Sridhar MS, Vemuganti GK, Bansal AK, Rao GN. Impression cytology-proven corneal stem cell deficiency in patients after surgeries involving the limbus. Cornea 2001;20:145-8. 17. Dua HS, Azuara-Blanco A. Autologous limbal transplantation in patients with unilateral corneal stem cell deficiency. Br J Ophthalmol 2000;84:273-8. 18. Dudney BW, Malecha MA. Limbal stem cell deficiency following topical mitomycin C treatment of conjunctival-corneal intraepithelial neoplasia. Am J Ophthalmol 2004;137:950-1. 19. Pires RT, Chokshi A, Tseng SC. Amniotic membrane transplantation or conjunctival limbal autograft for limbal stem cell deficiency induced by 5-fluorouracil in glaucoma surgeries. Cornea 2000;19:284-7. 20. Paris Fdos S, Gonçalves ED, Barros Jde N, Campos MS, Sato EH, Gomes JA. Impression cytology findings in bullous keratopathy. Br J Ophthalmol 2010;94:773-6. 21. Li W, Hayashida Y, Chen YT, Tseng SC. Niche regulation of corneal epithelial stem cells at the limbus. Cell Res 2007;17:26-36. 22. Collinson JM, Chanas SA, Hill RE, West JD. Corneal development, limbal stem cell function, and corneal epithelial cell migration in the Pax6(+/-) mouse. Invest Ophthalmol Vis Sci 2004;45:1101-8. 23. Secker GA, Daniels JT. Corneal epithelial stem cells: Deficiency and regulation. Stem Cell Rev 2008;4:159-68. 24. Dua HS, Saini JS, Azuara-Blanco A, Gupta P. Limbal stem cell deficiency: Concept, aetiology, clinical presentation, diagnosis and management. Indian J Ophthalmol 2000;48:83-92. 25. Zarei-Ghanavati S, Ramirez-Miranda A, Deng SX. Limbal lacuna: A novel limbal structure detected by in vivo laser scanning confocal microscopy. Ophthalmic Surg Lasers Imaging 2011;42:e129-31. 26. Zheng T, Xu J. Age-related changes of human limbus on in vivo confocal microscopy. Cornea 2008;27:782-6. 27. Fatima A, Iftekhar G, Sangwan VS, Vemuganti GK. Ocular surface changes in limbal stem cell deficiency caused by chemical injury: A histologic study of excised pannus from recipients of cultured corneal epithelium. Eye (Lond) 2008;22:1161-7. 28. Donisi PM, Rama P, Fasolo A, Ponzin D. Analysis of limbal stem cell deficiency by corneal impression cytology. Cornea 2003;22:533-8. 29. Sacchetti M, Lambiase A, Cortes M, Sgrulletta R, Bonini S, Merlo D, et al. Clinical and cytological findings in limbal stem cell deficiency. Graefes Arch Clin Exp Ophthalmol 2005;243:870-6. 30. Ramirez-Miranda A, Nakatsu MN, Zarei-Ghanavati S, Nguyen CV, Deng SX. Keratin 13 is a more specific marker of conjunctival epithelium than keratin 19. Mol Vis 2011;17:1652-61. 31. Barbaro V, Ferrari S, Fasolo A, Pedrotti E, Marchini G, Sbabo A, et al. Evaluation of ocular surface disorders: A new diagnostic tool based on impression cytology and confocal laser scanning microscopy. Br J Ophthalmol 2010;94:926-32. 32. Chen WY, Mui MM, Kao WW, Liu CY, Tseng SC. Conjunctival epithelial cells do not transdifferentiate in organotypic cultures: Expression of K12 keratin is restricted to corneal epithelium. Curr Eye Res 1994;13:765-78. 33. Garcia I, Etxebarria J, Boto-de-Los-Bueis A, Díaz-Valle D, Rivas L, Martínez-Soroa I, et al. Comparative study of limbal stem cell deficiency diagnosis methods: Detection of MUC5AC mRNA and goblet cells in corneal epithelium. Ophthalmology 2012;119:923-9. 34. Shortt AJ, Secker GA, Munro PM, Khaw PT, Tuft SJ, Daniels JT. Characterization of the limbal epithelial stem cell niche: Novel imaging techniques permit in vivo observation and targeted biopsy of limbal epithelial stem cells. Stem Cells 2007;25:1402-9. 35. Patel DV, McGhee CN. Contemporary in vivo confocal microscopy of the living human cornea using white light and laser scanning techniques: a major review. Clin Experiment Ophthalmol 2007;35:71-88. 36. Deng SX, Sejpal KD, Tang Q, Aldave AJ, Lee OL, Yu F. Characterization of limbal stem cell deficiency by in vivo laser scanning confocal microscopy: A microstructural approach. Arch Ophthalmol 2012;130:440-5. 37. Vera LS, Gueudry J, Delcampe A, Roujeau JC, Brasseur G, Muraine M. In vivo confocal microscopic evaluation of corneal changes in chronic Stevens-Johnson syndrome and toxic epidermal necrolysis. Cornea 2009;28:401-7. 38. Miri A, Alomar T, Nubile M, Al-Aqaba M, Lanzini M, Fares U, et al. In vivo confocal microscopic findings in patients with limbal stem cell deficiency. Br J Ophthalmol 2012;96:523-9. 39. Hong J, Zhu W, Zhuang H, Xu J, Sun X, Le Q, et al. In vivo confocal microscopy of conjunctival goblet cells in patients with Sjogren's syndrome dry eye. Br J Ophthalmol 2010;94:1454-8. 40. Efron N, Al-Dossari M, Pritchard N. In vivo confocal microscopy of the bulbar conjunctiva. Clin Exp Ophthalmol 2009;37:335-44. 41. Jeng BH, Halfpenny CP, Meisler DM, Stock EL. Management of focal limbal stem cell deficiency associated with soft contact lens wear. Cornea 2011;30:18-23. 42. Schornack MM. Limbal stem cell disease: Management with scleral lenses. Clin Exp Optom 2011;94:592-4. 43. Stason WB, Razavi M, Jacobs DS, Shepard DS, Suaya JA, Johns L, et al. Clinical benefits of the Boston Ocular Surface Prosthesis. Am J Ophthalmol 2010;149:54-61. 44. Dua HS. The conjunctiva in corneal epithelial wound healing. Br J Ophthalmol 1998;82:1407-11. 45. Anderson DF, Ellies P, Pires RT, Tseng SC. Amniotic membrane transplantation for partial limbal stem cell deficiency. Br J Ophthalmol 2001;85:567-75. 46. Nishiwaki-Dantas MC, Dantas PE, Reggi JR. Ipsilateral limbal translocation for treatment of partial limbal deficiency secondary to ocular alkali burn. Br J Ophthalmol 2001;85:1031-3. 47. Kenyon KR, Tseng SC. Limbal autograft transplantation for ocular surface disorders. Ophthalmology 1989;96:709-22. 48. Pellegrini G, Traverso CE, Franzi AT, Zingirian M, Cancedda R, De Luca M. Long-term restoration of damaged corneal surfaces with autologous cultivated corneal epithelium. Lancet 1997;349:990-3. 49. Rama P, Matuska S, Paganoni G, Spinelli A, De Luca M, Pellegrini G. Limbal stem-cell therapy and long-term corneal regeneration. N Engl J Med 2010;363:147-55. 50. Sangwan VS, Basu S, MacNeil S, Balasubramanian D. Simple limbal epithelial transplantation (SLET): A novel surgical technique for the treatment of unilateral limbal stem cell deficiency. Br J Ophthalmol 2012;96:931-4. 51. Tsai RJ, Tseng SC. Human allograft limbal transplantation for corneal surface reconstruction. Cornea 1994;13:389-400. 52. Biber JM, Skeens HM, Neff KD, Holland EJ. The cincinnati procedure: Technique and outcomes of combined living-related conjunctival limbal allografts and keratolimbal allografts in severe ocular surface failure. Cornea 2011;30:765-71. 53. Miri A, Al-Deiri B, Dua HS. Long-term outcomes of autolimbal and allolimbal transplants. Ophthalmology 2010;117:1207-13. 54. Nakamura T, Inatomi T, Sotozono C, Amemiya T, Kanamura N, Kinoshita S. Transplantation of cultivated autologous oral mucosal epithelial cells in patients with severe ocular surface disorders. Br J Ophthalmol 2004;88:1280-4. 55. Nakamura T, Kinoshita S. Ocular surface reconstruction using cultivated mucosal epithelial stem cells. Cornea 2003;22:s75-80. 56. Sejpal K, Yu F, Aldave AJ. The Boston keratoprosthesis in the management of corneal limbal stem cell deficiency. Cornea 2011;30:1187-94. 57. Tan A, Tan DT, Tan XW, Mehta JS. Osteo-odonto keratoprosthesis: Systematic review of surgical outcomes and complication rates. Ocul Surf 2012;10:15-25. 58. Falcinelli G, Falsini B, Taloni M, Colliardo P, Falcinelli G. Modified osteo-odonto-keratoprosthesis for treatment of corneal blindness: Long-term anatomical and functional outcomes in 181 cases. Arch Ophthalmol 2005;123:1319-29. 59. Pujari S, Siddique SS, Dohlman CH, Chodosh J. The Boston keratoprosthesis type II: The Massachusetts Eye and Ear Infirmary experience. Cornea 2011;30:1298-303.